Fig. 1. 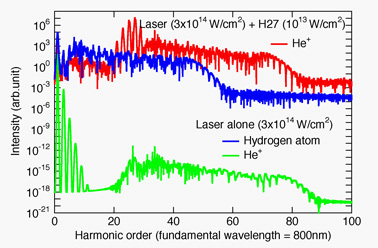 Top: harmonic spectrum from He+ irradiated by a combined laser and its 27th harmonic pulse. Middle: from H by laser. Bottom: from He+ by laser. E. Takahashi et al., Phys. Rev. A 66, 021802 (2002). K. Ishikawa and K. Midorikawa, Phys. Rev. A 65, 043405 (2002).